While immense success at the World cups by the Dutch national team shouldn’t come as much of a surprise, so far this season the Dutch skaters were met with stiff competition from the strong Japanese team. The Netherlands has so far captured 39 medals – 8 in the team events, and 31 in individual races. Over the course of the first half of the season the Dutch team showed their strength across all distances, with strong performances by young skaters Patrick Roest and Esmee Visser in the distance races, and Kjeld Nuis in the sprints. With podium sweeps in the 1000m and 1500m, the team will look to continue their strong performances at the European Championships and over the course of the rest of the season. The ever-strong Dutch squad has found consistent success in the team events, as well as the Mass Start – lead by strong performances from Simon and Irene Schouten. Kjeld Nuis has continued to find success in 1000m and 1500m through the first half of the season. The double Olympic gold medalist from Pyeongchang, has found himself on the podium at each of the World cup event he has competed in so far this season. Nuis currently sits in 3rd position in the 1500m, and in 2nd in the 1000m in the ISU World cup standings. Other skaters to make note of are Jan Smeekens, Kai Verbij and Thomas Krol, who have all found themselves on the podium over the course of the first half of the season. Smeekens and Verbij have each captured a single individual medal this season, while Krol has been nearly as consistent as Nuis – bringing home several medals in the 1000m/1500m. Patrick Roest has had a stellar season so far, from setting new track records at Thialf during the Dutch trials to his dominance in the long-distance races. Roest has captured 6 individual medals so far this season – he has been on the podium in every 1500m and 5000m race he has completed. The 2018 Allround champion looks to be in fine form as we head into the second half of the season and will be one to watch when the Allround championships descend on Calgary in March. Other skaters to make note of are Marcel Bosker and the legendary Sven Kramer who have also found success this season. On the women’s side, Esmee Visser has been excellent so far this season, and she currently sits second overall in the distance races in the ISU rankings. She has faced stiff competition from veteran Martina Sablikova and Isabelle Weidemann, and we may be seeing the birth of a rivalry between the young skater and Canadian Isabelle Weidemann. Antoinette de Jong and Ireen Wust have also found success in the first half of the season, capturing one individual medal each and helping guide the team pursuit squad to multiple podium finishes. Honorable mention to Sven Kramer, Antoinette de Jong and Kai Verbij for their titles at the European championships. Bien qu'il ne soit pas surprenant de voir les Néerlandais continuer de dominer sur le circuit de la Coupe du monde, le Japon leur a tout de même offert une forte opposition en cette première moitié de saison. Les Néerlandais ont remporté 39 médailles jusqu'à présent – 8 aux disciplines d’équipe, et 31 individuelles. Au cours de la première moitié de la saison, l’équipe néerlandaise a démontré sa force sur toutes les distances, avec de bonnes performances des jeunes patineurs Patrick Roest et Esmee Visser et du vétéran Kjeld Nuis. Avec des balayages de podium sur 1000m et 1500m, l’équipe cherchera à répéter ses bonnes performances pour terminer la saison en force. L'équipe néerlandaise a constamment connu du succès dans les épreuves par équipe, ainsi que dans le départ groupé grâce à Simon et Irene Schouten. Kjeld Nuis a eu beaucoup de succès au 1000m et au 1500m tout au long de la première moitié de la saison. Le double médaillé d'or olympique, s'est retrouvé sur le podium à chacune des Coupes du monde auxquelles il a participé jusqu'à présent cette saison. Nuis se retrouve en 3e position sur 1500m et à la 2e position sur 1000m au classement général de la Coupe du monde. Les autres patineurs dignes de mention sont Jan Smeekens, Kai Verbij et Thomas Krol, qui ont tous visité le podium jusqu'ici cette saison. Smeekens et Verbij ont chacun remporté une médaille individuelle, tandis que Krol a remporté plusieurs médailles sur 1000m / 1500m. Patrick Roest a connu un début de saison exceptionnel, avec des nouveaux records de piste à Thialf durant les qualifications néerlandaises dominant par la suite sur les longues distances en Coupe du monde. Roest a remporté 6 médailles individuelles cette saison - il est monté sur le podium dans toutes les courses auxquelles il a participé. Le champion toutes distances de la saison dernière semble être en pleine forme alors que débute le dernier droit de la saison. Marcel Bosker et le légendaire Sven Kramer ont également connu du succès. Chez les femmes, Esmee Visser a été excellente jusqu’à présent cette saison et elle occupe la 2e position du classement général de Coupe du monde. La première moitié de saison aura peut être vue naître le début d'une rivalité entre la jeune patineuse et la Canadienne Isabelle Weidemann. Antoinette de Jong et Ireen Wust ont également connu du succès au cours de la première moitié de saison, remportant chacune une médaille individuelle et aidant l’équipe de poursuite par équipes à monter sur plusieurs podiums. Mention honorable à Kai Verbij, Antoinette de Jong et Sven Kramer pour leurs titres aux Championnats d'Europe. Assurez-vous de vous abonnez à notre infolettre, de suivre notre page Facebook, notre compte Instagram et notre compte Twitter pour ne manquer aucune nouvelle sur le patinage de vitesse. I crossed Alex’s path for the first time many years ago during a speed skating camp in my hometown: her uncle was my coach at the time. At that time I didn’t know I had a future Doctor and an accomplished speed skater in front of me. Born in Sherbrooke, Canada and raised in an active family, Alex Lepage-Farrell started doing sports at a young age. She recreationally practiced tennis and soccer, but it was speed skating that turned into a passion when she was 10 years old. "I had to work hard because speed skating wasn’t innate for me." says Lepage-Farrell. It’s when she reached Quebec’s Elite circuit that the now Pediatric resident realised she had potential in this sport. 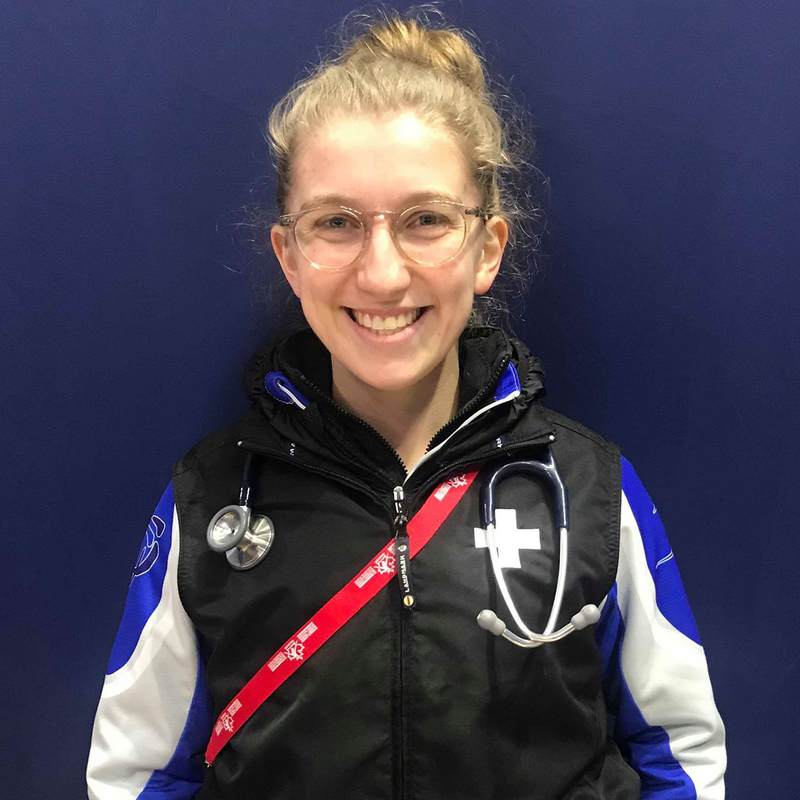 While in Cegep, Alex Lepage-Farrell studied health science full time knowing she was aiming for medicine at the university. She continued mixing school and skating but it started getting harder. In her second year of Cegep, she decided not to compete at the National qualifier to concentrate on school. As a result, she was not able to compete at the Canadian championships even if she could have got good results there. "It pretty much ended my first speed skating career. I was young and I had a hard time managing my on-ice and off-ice goals. I wanted to be good at everything. I felt it was unfair that I was going to school twice as much as my rivals on the ice and it affected my motivation and my focus. It was frustrating. When I think about it now, I believe it would’ve been possible to study while skating but I think I wasn’t mature enough to do it at the time." 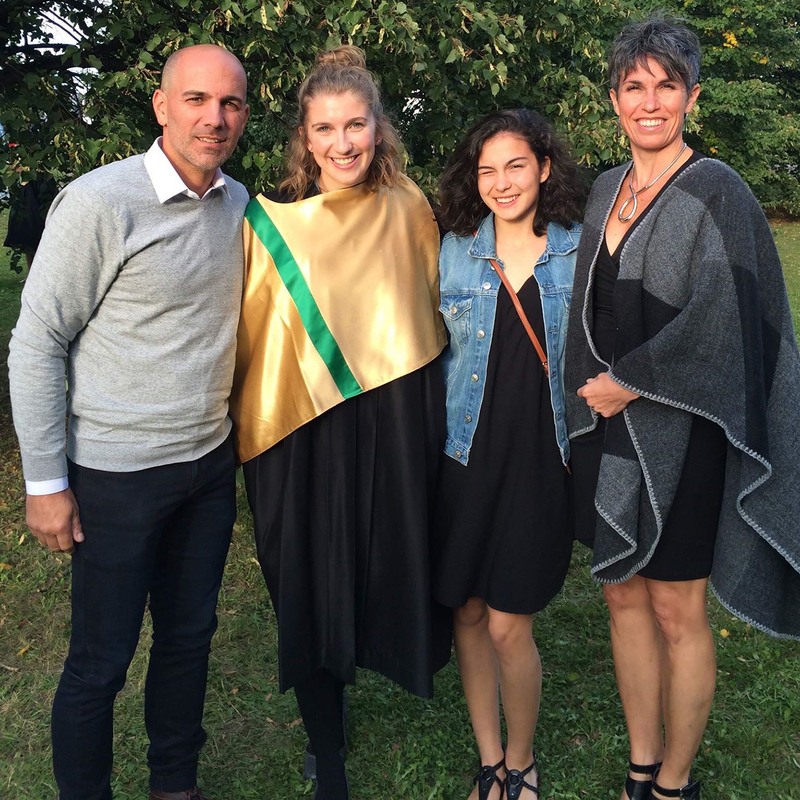 The next year, she started her medicine studies at the Sherbrooke University and she felt something was missing. "I missed skating, but not to the point of getting back to it. I had no regrets about my decision." A new challenge also appeared: she had to understand that she would not always be the best student in the class considering that everyone entering medicine has to be strong. "I decided to keep a social and active life so I had to be at peace with my choice and the fact that I wouldn’t be the best all the time." Lepage-Farrell worked on herself while studying medicine. "I can’t be mad at the fact that I stayed true to myself." Wanting to stay in shape, keep the adrenalin of sports and release stress, she practiced CrossFit, jogging and swimming during her four years studying medicine. Without competitive intention, she even ran two half-marathons as a personal challenge. 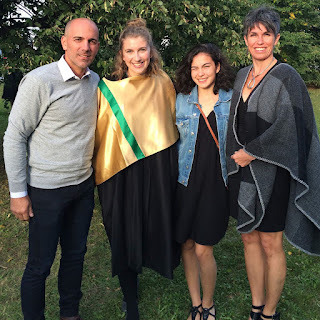 After receiving her Medicine diploma, Lepage-Farrell took part in a speed skating camp in Sherbrooke for fun and she also competed at the inline speed skating 24h of Montréal with her friends, a weekend she deeply enjoyed. That year, the first Quebec Elite circuit competition was held in Sherbrooke and Lepage-Farrell was designated as the doctor in charge at the competition. "It brought back memories of my first speed skating career. It was pretty much the turning point that made me want to skate again." She then started skating for fun when her schedule made it possible. "My trainers and my teammates accepted me whenever I was showing up. When I was skating I was a skater and when I was working on becoming a doctor I was 100% focused on that. I was able to separate the two" said Lepage-Farrell who was supported by her family a lot. After a while, her trainer asked her if she wanted to compete again. After some thinking, she decided to go back to it and go back to basic. "Now a weekend of competition is like a break where I take time for myself and where I have fun. Years later I simply accept my reality as a doctor. No matter what happens at the competition, I’ll go back to help my patients on monday morning." The same fall, she qualified for the Canadian national qualifier. She was ranked 39th at the start of the competition. She had no expectations, but finished 21st which was a big surprise for her. The first 16 had the chance to skate at the Canadian senior championships. "I was so close!" added Lepage-Farrell who finished the season ranked 37th. 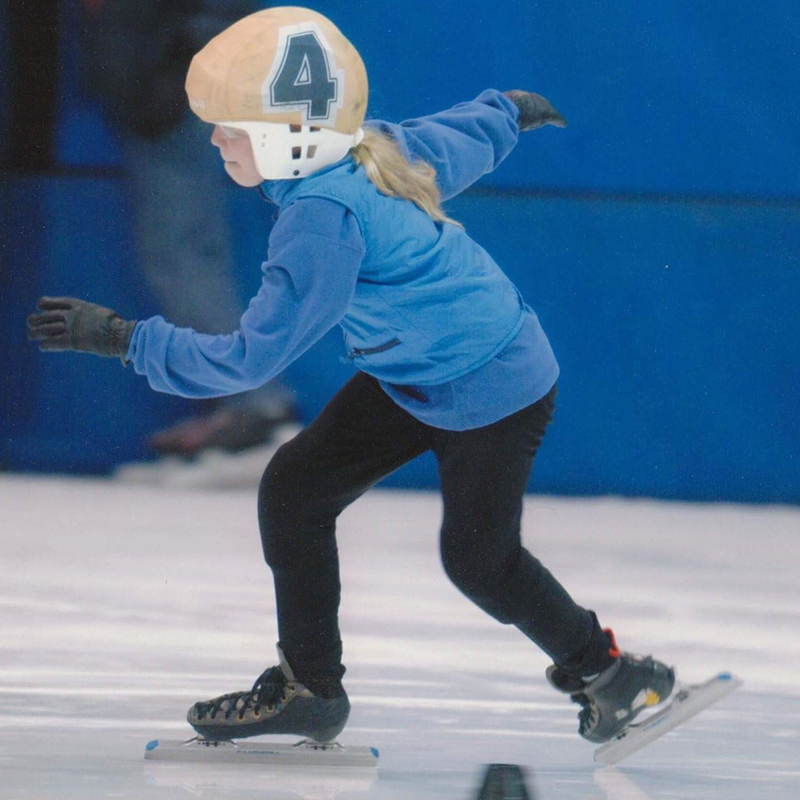 The same year that she went back to skating, Dre Lepage-Farrell started her residency in family medicine after being refused for the pediatric residency. "It was the first time that I was told ‘no’ because my grades weren’t good enough and I started questioning myself." Even if she was in a great team in family medicine, she didn’t like some aspects of the practice and wanted to concentrate on pediatric medicine: "Kids are resilients and full of hope. Sick kids will draw until the morning of their death and are always supported. It’s in that domain that I feel I can have a long term impact and where I can accomplish myself more." During that year, she went through the process of applying to make the switch to pediatric the following year. A change that is rarely seen since there is a high demand in family medicine. Her chances were almost non-existent, but she finally received a call that changed her professional career: the Sainte-Justine university hospital center in Montreal, the biggest mother-children hospital in Canada and one of the biggest pediatric center in America had opened up a place for her. "My life took an exciting turn, a 180o turn. It was a huge learning opportunity." After moving to Montreal, Alex Lepage-Farrell started her pediatric formation at the Sainte-Justine hospital. She had a few classes, but most of the time she was working and had bigger responsibilities. Sometimes, like when she had her pediatric intensive care rotation, she had to train less because of her 7am to 7pm, 5 days a week schedule. "I was able to train most of the time and still do because I accept the fact that sometimes I have to eat in my car while going to training and because I am an intense person." 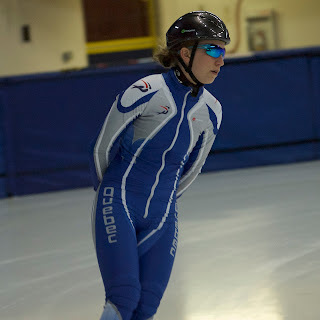 Since her arrival in Montreal, the young doctor trains at the Montreal Gadbois speed skating club. "I'm training less than my teammates, but just like in Sherbrooke, they accept me when I show up and they respect what I bring to the ice." 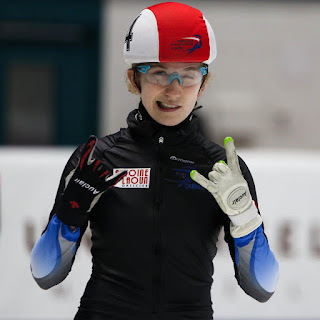 At the end of her first year in pediatric, Dre Lepage-Farrell finished 23rd overall in the Canadian short track ranking. "I couldn’t have predicted that. I need a certain detachment to enter my competing routine, but I’m happy to have that back in my life ! The stress of competing is now fun for me. It’s a lot different than in my 'first' skating career. At 17 years old, I thought my best years were behind me." Alex Lepage-Farrell is now in her second year of pediatric residency. 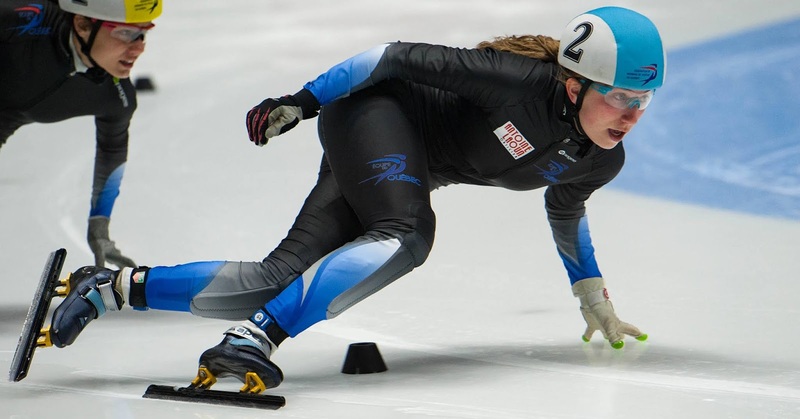 Last September, she placed 18th at the Canadian senior championships and she had the chance to represent Canada at the AM cup in Salt Lake City, an awesome racing experience. "It was a bit stressful to race on an ice as fast as that one and I crashed a few times, but I am happy that I had the chance to skate in my first international competition at my age! It wouldn’t have been possible without the support of my colleagues at the hospital who backed me up so I could pursue my dream!" In less than three weeks, the application process for the pediatric subspeciality will begin. Lepage-Farrell particularly likes the pediatric intensive care "I’ll give it a try almost everywhere in Eastern Canada, but it will be really hard to get a spot." She’s also highly motivated for the end of the speed skating season. "We’ll see the results! I still have no idea where I will be next year since I 100% want to pursue my two careers." We can’t speak of such accomplishments without mentioning her family who always supported her. Skating is a family thing for the Lepage-Farrell. Her younger sister Elizabeth is also skating, and her parents were always there for her. "When I was young they pushed me, now they bring me back to reality, the reality I chose to live. Everything is in the choice we make." "People often ask me if I am curious about where I would be if I had not stopped the first time. Nobody knows. What I know is that in the next Olympics period, I will be doing my very last exam. I’ll graduate as a pediatric doctor no matter what. I would switch that for nothing in the world." What tips would Alex Lepage-Farrell give to young skaters who are trying to successfully mix sport and school? "We have to choose for ourselves, for what we really want to do and make sure that we deeply believe in our choice so we have no regret. Nobody should be scared of the process when they do what they love. Having something else in our live, other passions, can become a powerful asset, a hidden card even!" says the 25-year-old doctor, currently in her second year studying pediatric care while skating at a high level. J’ai vu Alex pour la première fois il y a bien des années à un camp de patinage de vitesse dans ma ville natale: son oncle était mon entraîneur à l’époque. À ce moment, je ne savais pas que j’avais devant moi une future médecin et une future patineuse accomplie en même temps! Native de Sherbrooke et d’une famille de sportifs, Alex Lepage-Farrell a goûté au sport dès son plus jeune âge. Même si elle a pratiqué récréativement le tennis et le soccer, c’est néanmoins le patinage de vitesse qui a conquis son coeur à son 10e anniversaire. « Cependant, c’était pas inné, pour moi. J’ai dû beaucoup travailler », avoue-t-elle. C’est lorsqu’elle accède au circuit élite québécois à la fin du secondaire que l’actuelle résidente en pédiatrie saisit le potentiel qu’elle a dans ce sport. La jeune diplômée en médecine de l’Université de Sherbrooke s’est inscrite au camp d’été de patin de sa ville natale, l’été suivant l’obtention de son diplôme. « Cet été-là, j’ai aussi fait le 24h roller de Montréal avec mes amis. J’ai eu tellement de plaisir! » admet-elle. À l’automne de cette même année, la première compétition du circuit élite québécois se tenait à Sherbrooke: « J’étais médecin désigné lors de cette compétition, et honnêtement, je ne me suis souvenu que des bons moments vécus dans ce sport, le reste était parti. » Dre Lepage-Farrell marque cet évènement comme l’élément déclencheur de son retour dans le patinage de vitesse. Elle a alors recommencé à patiner, pour le plaisir, quand son horaire lui permettait. « Ils [ses collègues d’entraînement et ses entraîneurs] me prenaient quand je passais. Je ne ramenais pas le travail au patin ni le patin au travail. Quand j’étais dans l’un des deux, j’y étais à 100% », dit-elle en affirmant que son entourage l’a beaucoup aidée. Après quelque temps d’entraînement, son entraîneur de Sherbrooke lui a demandé si elle était intéressée à recommencer la compétition. Après un peu de réflexion, elle a accepté de recommencer la compétition… en bas de l’échelon! « J’ai pris cette décision parce que maintenant, une fin de semaine de compétition, c’est un moment que je prends pour moi, où j’ai du plaisir. C’est un congé. J’en suis capable, maintenant, des années plus tard, parce que j’accepte tout simplement ma réalité de médecin. Quoi qu’il arrive en compétition, que ça aille bien ou mal, je vais retrouver mes patients le lundi matin », dit la jeune médecin en toute sérénité. Lors des premières compétitions suivant son retour, Alex Lepage-Farrell dit avoir conservé une bonne lecture de course. Ce même automne, elle s’est aussi classée pour les qualifications nationales, où elle occupait le 39e rang avant la compétition: « Je n’avais aucune attente. Zéro. Après deux jours de compétition, j’étais classée 19e et j’ai terminé 21e au terme de la compétition. C’était une grande surprise. » Les 16 premières patineuses avaient accès aux championnats canadiens seniors. « J’étais tellement près! » s’exclame-t-elle. Néanmoins, après sa participation à la deuxième sélection senior, elle termine au 37e rang du classement cumulatif senior de fin de saison. Nouvellement déménagée à Montréal, Alex Lepage-Farrell débute sa formation en pédiatrie à l’hôpital Sainte-Justine. Elle a quelques cours, mais elle travaille, surtout, et maintenant de grosses responsabilités l’accompagnent. Lors de son stage en soins intensifs pédiatriques le printemps dernier, elle dit s’être moins entraînée, ayant des journées très occupées de 7h à 19h et plus, 5 jours par semaine, couronnés par de longues gardes. « Je réussis à m’entraîner la plupart du temps, puisque j’accepte de manger dans mon auto et puisque je suis une personne intense », dévoile-t-elle en riant. Depuis son arrivée dans la métropole, la jeune médecin s’entraîne avec le club de patinage de vitesse de Montréal-Gadbois: « Je m’entraîne moins que le reste du groupe, mais eux aussi, ils [ses collègues d’entraînement et ses entraîneurs] me prennent quand je passe et ils respectent ce que je peux donner. » dit-elle avec reconnaissance. Au terme de cette première année de pédiatrie, Dre Lepage-Farrell s’est non seulement classée pour les sélections seniors, mais elle terminent 23e au cumulatif canadien senior: « Je n’aurais jamais pu prédire ça. Je dois avoir un certain détachement pour rentrer dans ma routine de compétition, mais j’ai aimé la retrouver! Le stress des compétitions est devenu le fun, pour moi. Ça n’a rien avoir avec avant, dans ma “première” carrière. Je ne pensais jamais y reprendre goût autant! À 17 ans, je pensais que mes meilleures années étaient derrière moi », avoue avec émotions celle qui s’est même fait mouler de nouveaux patins. « Les gens me demandent si je suis curieuse de savoir où je serais en patin si je n’avais pas arrêté la première fois. Personne ne peut le savoir. Ce que je sais, par contre, c’est qu’au moment des prochaines sélections olympiques, j’en serai à passer mon Collège royal de pédiatrie. Je vais graduer comme pédiatre quoi qu’il arrive. J’échangerais ça pour rien au monde », confie-t-elle. Que conseillerait Alex Lepage-Farrell aux jeunes qui commencent à vivre avec la conciliation sport-étude? « Il faut choisir, pour soi, ce qu’on veut vraiment faire et assumer ce choix pour n’avoir aucun regret. Personne ne devrait avoir peur du processus quand on fait ce qu’on aime faire. Aussi, avoir d’autres choses dans sa vie, d’autres passions qu’on chérit, peut s’avérer un atout puissant, une carte cachée, même», révèle la jeune femme médecin de 25 ans, étudiante en deuxième année en pédiatrie et patineuse de vitesse accomplie. Dordrecht Jour 2: Le retour d'Elise Christie! Dordrecht Day 2: Christie is back!